Top » ENGLISH » STUDY THE WORD OF GOD » HIS PARENTS FOUND JESUS SITTING IN THE MIDST OF THE TEACHERS. The feast of the Holy Family is a relatively recent development. In the 19th century, the devotion to the Holy Family spread around the world. Joseph, Mary, and Jesus were seen as a model not only for the nuclear family, but also the extended family, the parish family, and indeed the global family of nations. Jewish law required all Jews to go to Jerusalem for the three feasts of Passover, Pentecost, and Tabernacles. Luke depicts the Holy Family as being pious and observant of the law, as they make their annual pilgrimage to Jerusalem for the great feast of Passover. Jesus is twelve years old. This was the age of initiation into adulthood/manhood. 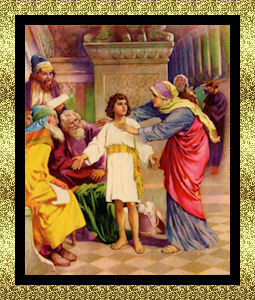 At thirteen a Jewish boy celebrates his “Bar Mitzvah” (son of the commandment). At Bar Mitzvah, a boy reads the Hebrew Scripture and explains it to the elders in the Temple. This passage is a transition between Jesus birth and his adult work. When Joseph discovered Jesus was absent from the company of men, he probably concluded that he was struggling with his transition from the women’s company. On the other side, Mary probably thought Jesus was at last with the men as it would be appropriate for a young man his age now. Only after a days journey, when Jesus could not be found among male or female relatives and friends did his family realize that he was not in the caravan at all. Every parent can empathize with Joseph and Mary’s panic and fear when they discover that Jesus is missing. When they find Jesus, he is sitting as a student in the midst of adult men and teachers, who are amazed at his understanding. Luke thus indicates that Jesus has successfully made the transition into the adult world. The interaction between Jesus and his parents is presented in very human terms. Mary and Joseph are stunned that he would stay behind without telling them, and Mary corrects her son, as any mother would, for this irresponsible behavior. The answer Jesus gives marks a turning point. It anticipates his future ministry, and marks a shift from calling Joseph his father to speaking of God as his Father. Mary and Joseph do not understand their son. Jesus, on the other hand, is starting to understand his special relationship to the Father and his mission. The final verses speak of normal family life and normal human development. Jesus grows and matures in an ordinary human way, under the guidance of Joseph and Mary. Celebrating the feast of the Holy Family is a time to look at Joseph, Mary, and Jesus as a R.E.A.L. family, an earthly family, not a pious, out-of-this-world type of family. They are a family that understands the great anxieties and sorrows of family life. The Holy Family is our model of how a family can be holy and RE.A.L. By R.E.A.L., I mean Respecting-Encour­aging-Affirming-Loving (attributed to Gene Wallace). It’s been said that the family is a garden and that what­ever is planted in it will grow. Planting these four values in your family will bring forth a harvest of an abundant family life. I am reminded also that there exists the Law of the Fallow Field. Simply stated, this law holds that if nothing positive is planted in the garden, it will always revert to weeds. Yes, we have to continually plant each growing season exactly what it is we expect to grow; if nothing of value is planted, nothing of value will be harvested. · time, attention and cultivation. · sunshine of laughter and affirmation. · the rains of difficulties, tense moments of anxieties and serious discussions on important matters. · areas of hardness to be turned over—bitterness, envy, anger, unforgiving hurts. · 5 rows of Ps: Perseverance, Politeness, Praise, Peace­making and Prayer. · 4 rows of Let us: Let us be faithful in word and deed; Let us be unselfish with our resources; Let us be loyal; Let us love one another. · 3 rows of Squash: Squash gossip, Squash criticism, and Squash indifference. · 5 rows of Turn ups: Turn up on time for school plays, scout meetings and baseball games; Turn up for family gatherings; Turn up with a better attitude; Turn up with new ideas and the determination to carry them out; and Turn up with a smile. If you plant and nurture these “value seeds” in your family garden, you will bring to a bountiful harvest a R.E.AL. family, as well as a holy family.